Reynoldsburg City School District provides high-quality learning environments to ensure each student reaches their level of success. With that in mind, the mission of the Food Service Department is to provide students and staff with meals that are nutritious, appetizing, and appealing. Meals served at all levels meet the age-appropriate USDA nutritional requirements for a balanced meal, complying with Congress's Healthy Hunger Free Kids Act that all districts must now follow. RCS Food Service department also offers a free summer meal program for children up to age 18. 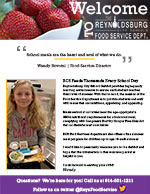 The Reynoldsburg City Schools Food Service department is excited for another school year of serving healthy meals to students and staff. Learn more about what's new in Food Service for the 2018-19 school year. We're so glad you're here! We would like to personally welcome you to the RCS Food Service Department. Everything you need to know about Food Service is in the welcome packet below. Learn about our breakfast and lunch programs, free and reduced meals, how to add money to your child’s lunch account, allergen information and the forgotten lunch money policy. If you have any questions, please give us a call at 614-501-1211. Our District has developed a Wellness Policy that is focused on improving the health of students. The policy was developed by the health and wellness advisory council.